← Pier Fire Update, 8:20am, 9/5/17. 20,529 Acres Burned. Pier Fire Update, 7:45 am, 9/6/17: 20% Contained. Today, officials downgraded evacuation orders for residents along Balch Park Road, Bear Creek area, Mountain Home State Forest, and SCICON area from mandatory to voluntary. All portions of Balch Park Road and Bear Creek Road will remain closed, however residents are able to enter showing proof of residency to posted law enforcement. Conditions may change in the next 36 hours for communities downgraded, causing officials to re-issue mandatory status if necessary. Returning residents should show caution, personal safety and be aware of possible debris and smoke inhalation. The following communities remain under mandatory evacuation orders: Upper Rio Vista, Cow Mountain (Springville),Camp Nelson, Sequoia Crest, Mountain Aire (Rogers Camp), Cedar Slope, Alpine, Doyle Springs, Wishon, and Pierpoint. The following communities remain under voluntary evacuation: Springville and Ponderosa. For further information in regards to Pier Fire evacuation orders and road closures please call the Tulare County EOC 559-623-0200. There was no change in acres burned or containment today, information will be updated Wednesday morning. On the western portion of the fire, just east of Balch Park Road, firefighters made good progress putting in direct fireline along the fires edge. The Fox Farm Road east of Wishon continues to be the northern perimeter line, keeping the fire south of Wishon Campground and the community of Doyle Springs. Work continues to improve contingency lines near Sequoia Crest, where several spot fires have tested the fire lines. The focus is now on improving the contingency lines from Sequoia Crest to HWY 190. Firing will take place to tie in the uncontrolled edge of the fire to the established contingency lines once they are completed. This effort will help to secure that edge of the fire. Yesterday’s active fire along Bateman Ridge from HWY 190 up to Rogers Camp will need a lot of work by firefighters to hold that edge of the fire today. Indirect fire lines will be put in place because the vegetation in this area hasn’t burned in over 100 years. It is not safe for firefighters to work on the edge of the fire in this thick vegetation. Structure protection is ongoing where necessary. Once complete, firing will need to begin to secure that edge of the fire. When fuel and weather conditions are favorable, firing will begin on the south and southwest edges of the fire. This effort will tie in the active fires edge into the indirect lines that have been well established by crews over the past few days. Watch a video, filmed at the Hayden Pass Fire Helibase in Colorado, to see one example of a tool used for firing out in steep terrain. 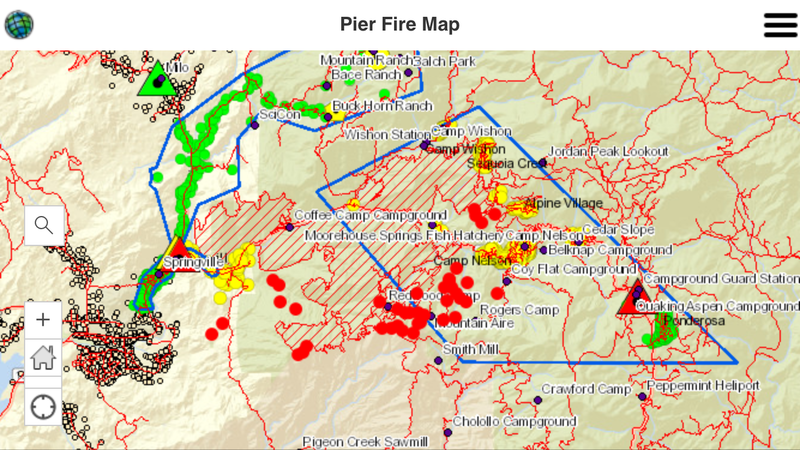 Winds over the higher elevations of the fire supported continued moderate and high intensity surface fire. Widespread smoldering in areas of deep seated heat were observed throughout the night. Rollout remained persistent along steep terrain. Partly cloudy with a 20% chance of thunderstorms through 10 pm. Minimum temperature 67-72 below 3000 feet and 58-62 higher elevations. Maximum relative humidity 70-75% below 3000 feet and 50-55% higher elevations. Winds downslope 2-6 mph with gusts to around 12 mph in larger drainages. This entry was posted in fire, Fire Brigade, ponderosa and tagged cal fire, california fire, containment, fire, fire safety, pier fire, ponderosa, Springville, wild land fire. Bookmark the permalink. 1 Response to Pier Fire Update, 7:45 am, 9/6/17: 20% Contained.